Erect thorny shrub, dark green leaves, masses of white flowers spring - early summer. 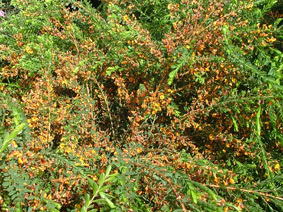 Small shrub, small green linear leaves, masses yellow and orange pea flowers spring. 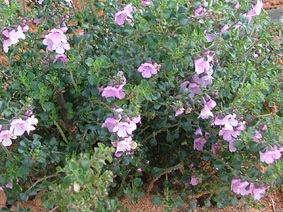 Small to medium shrub, blue-grey leaves, open pale pink - mauve flowers winter - spring. Small shrub, small green leaves, masses pink flowers winter-spring. 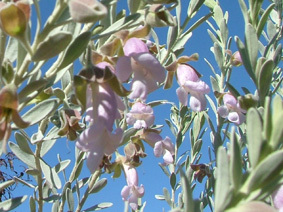 Erect shrub, soft grey foliage, pink - mauve flowers late winter - spring. Erect shrub, smooth green leaves, showy large woolly pink-lilac-grey flowers above foliage in spring - summer. Low spreading shrub, fragnant foliage and masses of pink - white flowers in summer. Medium shrub, white flowers spring - summer. Small shrub, rounded heads of pink-mauve flowers in spring. Small dense shrub, pink flowers autumn - spring. Small open shrub, profusion of pink-white flowers spring - early summer. Erect shrub, broad leaves, clusters of red flowers throughout the year. Spreading shrub, bright geern foliage, white star shaped flowers spring. 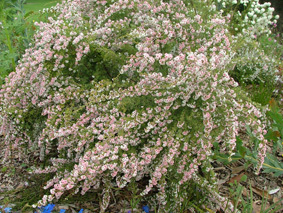 Small shrub, bright green foliage, pink star shaped flowers spring. Spreading shrub, bright green foliage, white star shaped flowers spring. 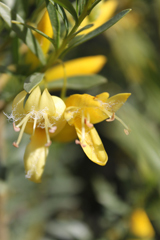 Pendulous shrub, pine-like leaves, yellow terminal flower spikes in summer. Leafless grey branches, single yellow flowers. Prostrate form, leaves grey, yellow flowers. Small shrub with dense weeping lime-green wavy compact foliage. Small compact shrub with dense fine lime-green weeping foliage. Erect shrub, leaves hard rasp-like surface, golden rod shaped flowers spring. Prostrate form, arching branches, yellow flowers. Prostrate form, weeping habit, bright yellow flowers. 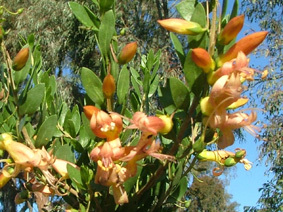 Tall shrub, fine soft hairy foliage, reddish flowers. Small shrub, fine soft hairy foliage, reddish flowers. Medium shrub, many blue-purple flowers August - November. 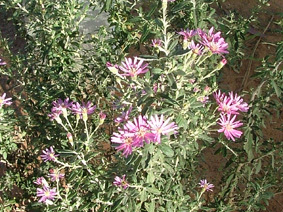 Medium shrub, profuse pink flowers in September - October..
Small low spreading plant, white flowers spring, greyish fruit. 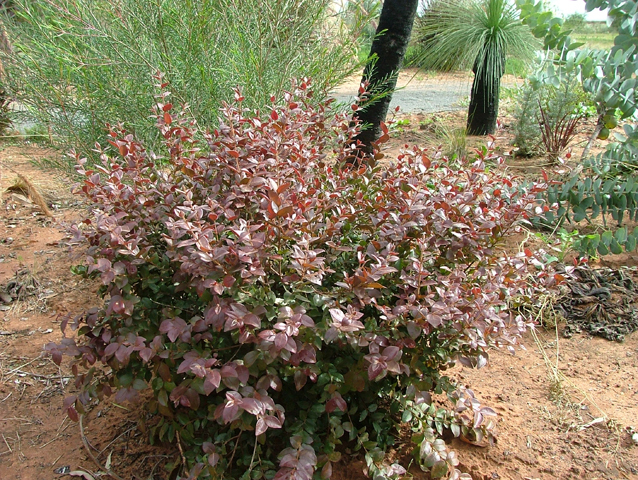 Bushy small shrub, deep red-burgundy new foliage, white flowers spring. Small to medium shrub large yellow-orange flowers autumn-winter. Rounded shrub, yellow flower spikes summer-autumn. Rounded shrub reddish flower spikes autumn. Small shrub, apple green new foliage, bright red flowers. Medium shrub, pink flowers spring. Small shrub, white to light pink flowers in spring, good grainage required. Outstanding plant in flower, white flowers late winter - spring, good drainage needed. Outstanding plant in flower, deep pink - purple flowers late winter - spring, good drainage required. 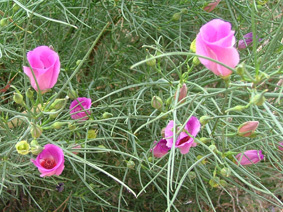 Outstanding plant in flower, pink flowers late winter - spring, good drainage required. Long flowering period, deep purple flowers late winter - spring, good drainage required. Medium shrub, large deep pink-mauve flowers late winter-spring. Local species, medium shrub, grey foliage, ruby red fruits. Small shrub, orange yellow and pink flowers spring. Small twinning plant, orange-red flowers during spring. 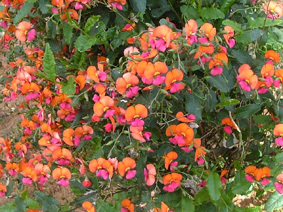 Small shrub, with heart shaped toothed leaves, brillant orange yellow pink flowers, spring. Low growing groundcover with brilliant massed orange- yellow flowers August - September. Upright shrub, glossy dark green leaves, pale cream-green flowers in spring. Medium shrub, pale green flowers. 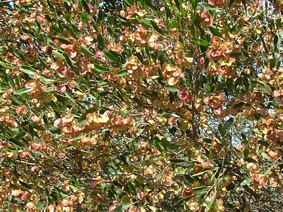 Large open shrub, pink-red flowers tipped pale green autumn-winter. Spreading shrub, lemon-scented leaves, white to reddish flowers spring. Attractive compact shrub, long toothed leaves, yellow-orange flowers in spring. Dense medium shrub, profuse yellow flowers September - October. 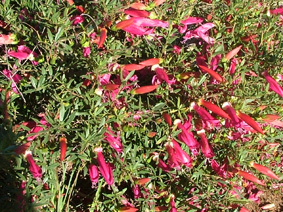 Erect shrub, female plant has colourful seed set in Septeber - October, hardy plant. Spreading shrub, brilliant orange terminal flowers spring. Small shrub, very pale pink flowers, spring. Small compact shrub, fine green foliage, light blue-violet flowers winter-spring. 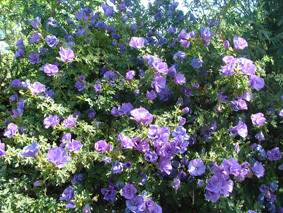 Open shrub, hairy grey leaves, large blue-mauve flowers, requires good drainage. Erect sparsely branched shrub, pink-magenta flowers spring-summer. Upright shrub, dull grey-green leaves, lilac flowers spring-summer. Open shrub, pink flowers autumn-spring. Low open shrub, small dark green leaves, blue flowers in spring. 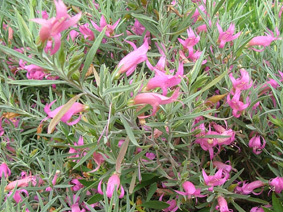 Medium shrub, grey leaves, pink flowers August - December, good drainage required.. Compact rounded shrub, grey leaves, orange-yellow flowers winter-spring. 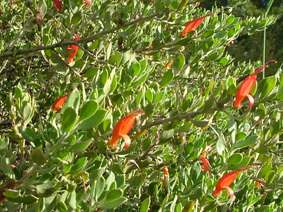 Medium shrub, grey leaves, orange-red flowers. Small hardy low spreading shrub, dark green foliage, bright orange-red flowers winter-summer. Full sun. Small shrub, grey leaves, light purple flowers in spring.. Spreading rounded shrub, dull green foilage, orange-yellow flowers mostly in spring, requires good drainage. Spreading shrub, grey foliage, lilac-purple foliage. Full sun. 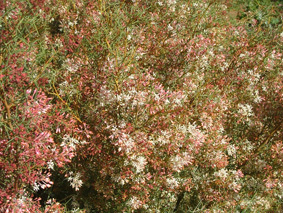 Medium shrub, weeping tangled foliage, pink flowers September - November. 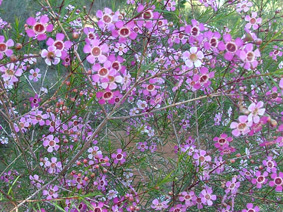 Small compact shrub, grey-green leaves, with large pale pink flowers during spring-autumn. 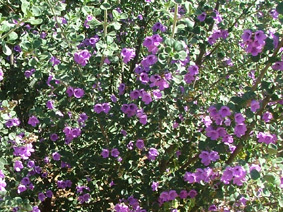 Attractive spreading shrub, grey foliage, large purple flowers during spring - autumn. Variable shrub, red flowers spring. Variable shrub, yellow flowers autumn-spring. 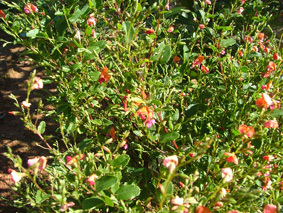 Medium shrub, apricot flowers autumn-spring, good drainage required. Rounded shrub, brilliant cerise flowers autumn-spring. Meduim shrub, mauve - purple flowers in spring, good drainge required. Upright shrub, light green foliage, yellow flowers. Spreading compact shrub, bright green foliage, flowers pale pink, spring-summer. Medium shrub, bright deep pink flowers winter-spring. 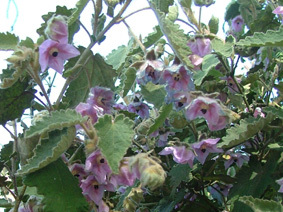 Upright shrub, silvery grey leaves, violet-purple flowers, requires good drainage. Upright shrub, narrow leaves, blue flowers winter-spring. Small spreading shrub, blue flowers spring-summer. 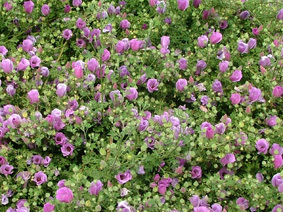 Medium shrub, bright green foilage, pale purple flowers. Full sun. Rounded many branched shrub, large white flowers, spring. Small shrub, blue-mauve flowers spring. 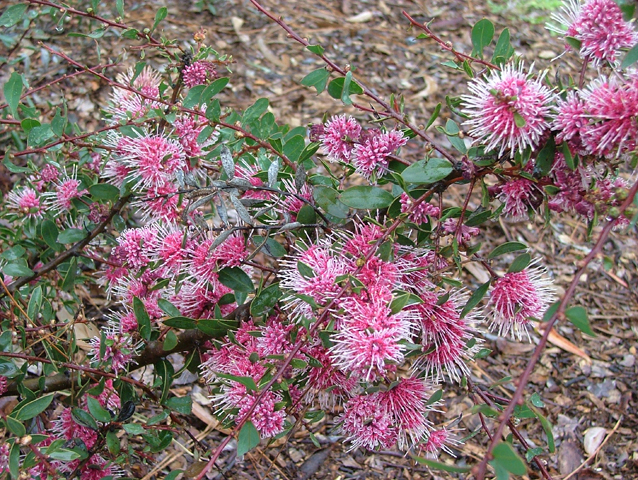 Erect shrub, silver grey foliage, pink-red flowers winter-spring. Attractive medium shrub, grey foliage, red flowers. Full sun. Open shrub, grey-white foliage, pale pink-lilac flowers in spring, good drainge required. Small shrub, profuse yellow-orange flowers in spring, most soils. Dense spreading shrub, upright grey foliage, masses red pea shaped flowers spring. Prostrate traling plant, red flowers spring - summer, burgundy coloured foliage. Open trailing plant, green grey leaves, black pea shaped flowers spring. 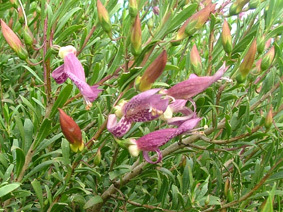 Open shrub, light green foliage, pink flowers. Medium dense shrub, grey foliage, red flowers autumn - winter. 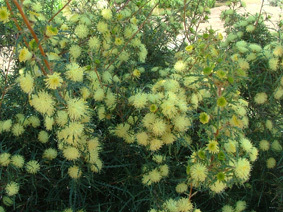 Medium shrub, grey-green foliage, green-yellow brush flowers, late summer-early winter. 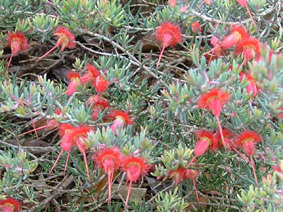 Medium shrub decorative large orange-red flowers throughout the year. Small shrub, light green toothed leaves, lemon-cream flowers ageing to pink-apricot, spring-early summer. Small spreading shrub, fine light green foliage, red-orange flowers winter-spring. Dense shrub, profuse fragrant pink-creamy white flowers winter-spring. Large decorative shrub, narrow green leaves, profusion of large red -pink flowers late winter - summer. 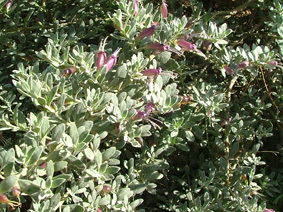 Medium shrub, grey-green foliage, mauve-purple flowers above foliage, late winter-spring. Large open shrub, green leaves, red flowers spring. 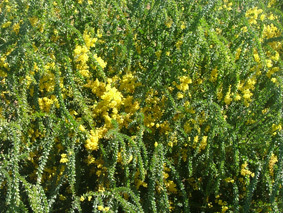 Medium shrub, narrow green leaves, yellow flowers spring. Compact shrub with horizontal branches, yellowish flowers spring. Rounded shrub, yellow flowers in spring. Small shrub, yellow fluffy flowers with a long flowering period during autumn -summer . Local species, open erect shrub, profuse sprays of purple-lilac flowers spring. Medium shrub, pink-mauve flowers winter-spring. Upright spreading shrub, fragrant white flowers spring. Upright spreading shrub, fragrant pink flowers spring. Compact erect plant, hardy, profuse pink flowers September - October. Erect shrub, deep pink flowers in spring, good drainge required. Rounded weeping shrub, grey green leaves, bright red flowers in September - November. Small shrub, clusters of pink flowers winter-spring full sun or part shade. Small shrub, greenish white flowers spring. full sun or part shade. 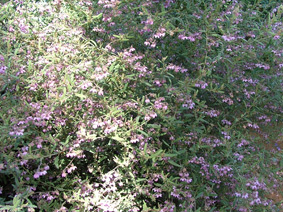 Low spreading shrub, masses of mauve-pink flowers spring full sun or part shade. Prostrate form, rusty brown and greenish flowers in spring, part shade. 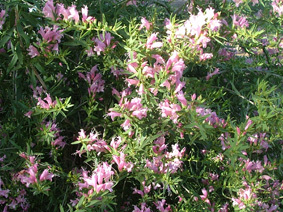 Low growing shrub, pink flowers spring summer, full sun or part shade. Low growing shrub, pink flowers spring, full sun or part shade. Small shrub, white flowers, spring, full sun or part shade. Low spreading shrub, massed white flowers September - October.. Spreading shrub, lavender-cream mottled flowers spring. 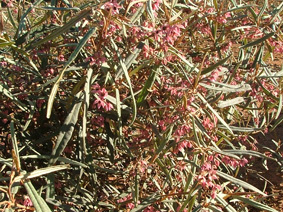 Rounded shrub, silvery grey foliage, pink flowers spring. Unpright shrub, silver grey leaves, greenish yellow flowers. Medium shrub, brilliant red flowers, spring and summer. 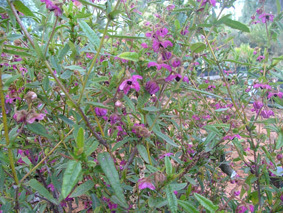 Erect shrub, showy purple flowers in spring. Compact shrub, deep pink terminal flowers, spring. Low spreading shrub, deep violet flowers, summer. Dense spreading shrub, deep pink flowers, spring. 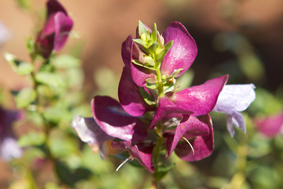 Attractive plant with its mauve - pink flowers August - October , shade or full sun. Ornamental plant due to its clusters of white flowers September - November, foliage and habit. Part shade or full sun. 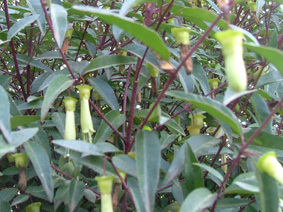 Erect shrub, small grey-green leaves, white-cream flowers autumn-winter. Erect shrub, grey-green foliage, blue flowers spring. 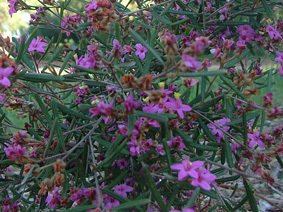 Erect shrub, grey-green foliage, pink flowers spring. Outstanding rounded shrub, glossy green foliage, profuse pink terminal flowers spring. Rounded shrub, glossy green foliage, profuse pale pink terminal flowers September - October. Small upright shrub, glossy dark green foliage, white terminal flowers, spring, part shade. Small shrub, pink-mauve flowers in spring. Large-medium shrub, yellow flowers in spring. Medium shrub, pale yellow flowers in spring. Medium shrub, yellow flowers spring. 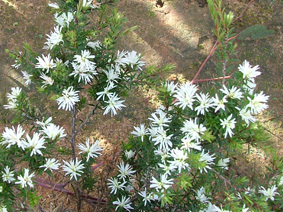 Small open shrub, profusion of white star shaped flowers late winter - spring. 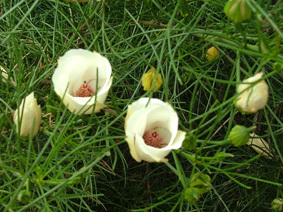 Small to medium shrub, fine light green foliage, masses of white flowers autumn - winter. Low open shrub, red flowers spring. Rounded shrub, profuse violet flowers August - September, strong leaf fragrance. Erect shrub, outstanding mauve and purple flower display spring. Erect shrub, profuse violet - purple flowers September - October. Rounded compact shrub, outstanding profuse purple flowers spring. Rounded compact shrub, profuse pink flowers spring. Small to medium shrub, deep purple flowers in spring. Small upright shrub, masses of white star flowers (male) autumn-winter. 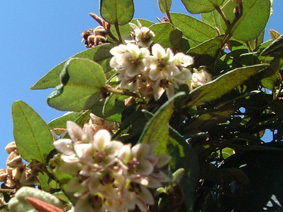 Erect shrub, aromatic leaves, white flowers over a long period, spring - summer. Local species, silvery foliage, yellow flowers spring-summer. Small shrub, pink-mauve flowers August - September, full sun or part shade. Small shrub very pretty in flower, pink flowers, full sun or part shade. Small shrub very pretty in flower, mauve-purple flowers, full sun or part shade. Small shrub, large pink flowers spring, full sun or part shade. 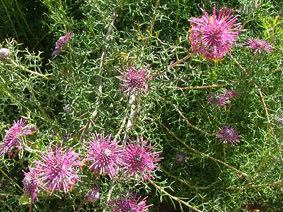 Small shrub, large green-grey felt like leaves, pink flowers August - October. Small compact rounded shrub, mauve-purple showy flowers, September - November..
Low spreading shrub, profuse pink cupped flowers very showy spring. Low spreading small shrub, masses pink-mauve flowers spring full sun or part shade. Small shrub, profuse pink-violet flowers autumn-winter. Rounded shrub, profuse white flowers winter-spring. Pendulous shrub, pale pink flowers autumn-spring. Pendulous shrub, white flowers winter-spring. Pendulous shrub, pink flowers winter-spring. Small low spreading shrub, pink flowers late winter - spring. Small shrub, profuse pink-violet flowers, autumn-winter. Small shrub, feathery bright yellow flowers spring-summer, good drainage. 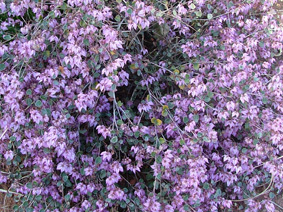 Small shrub, mauve - purple flowers September - November, good drainage. Small shrub, masses of pink flowers in spring, good drainage. 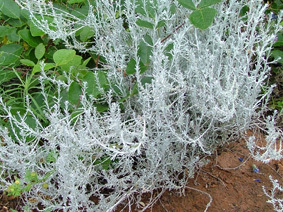 Rounded shrub, grey foliage, white flowers. Compact shrub, dark green leaves, pink flowers winter-spring.